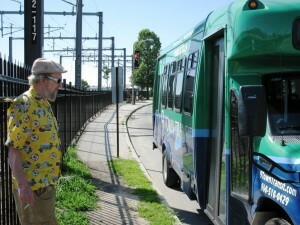 On Wed., June 8, the Estuary Transit District, better known as 9 Town Transit, in Centerbrook, Conn., received the Rural System of the Year award at this year’s Community Transportation Association Expo in Indianapolis. The Community of Transportation Association of America (CTAA), celebrating its 25-year anniversary, organized the event. The award is given each year to the transportation agency that provides service in a non-urban area with a population of less than 50,000. The award is given to a transit operation that has presented innovative and creative services within the community, and has displayed exceptional responsiveness to its customers’ and community needs. The district was selected from amongst the 4,000 member agencies. CTAA was most impressed with the implementation of new technology and 9 Town Transit’s (9TT) ability to expand services despite the current economic climate. Over the past two years, 9TT has implemented a GPS based dispatching system, text message alerts to passengers, online trip booking and pass sales, and regular updates through various social media outlets. With the help of the Connecticut Department of Transportation, 9TT has also been able to add new services to Middletown and New London from Old Saybrook, as well as add hours to existing services to accommodate commuters. The efforts have caused ridership to grow almost 40% during this period. The award is especially gratifying considering 9TT’s financial difficulties in the not so distant past. In 2006, the district had depleted its reserve funds and was forced to request additional funding from its member towns. Many member town First Selectman joined the district’s Board of Directors to help stabilize the district, and transit management company First Transit was hired to provide professional management.